On November 23, 2018, at the Palace of the National Military Circle, Aspen Institute Romania hosted the 8th edition of the ASPEN LEADERSHIP AWARDS AND GALA DINNER, our most special annual event, marking 12 years of existence of the Institute and of our common quest for a “Good Society”. 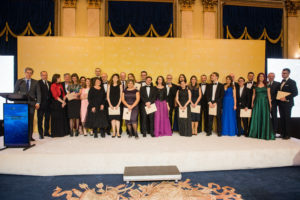 Already a treasured tradition, the Aspen Institute Romania Leadership Awards and Gala Dinner represent the opportunity for the thriving and growing Aspen community to reunite and revisit its shared values and interests. A pleasant night among friends, a celebration of values-based leadership, innovation and excellence, the event aims to allow all of our guests a moment of reflection on what is the added value of our community. The AIR founders and team were tenacious enough to establish, build and carefully support through the years the embodiment of the Aspen Idea in Romania. The Aspen Gala offers to the Aspen Young Leaders, Aspen Fellows and Alumni the opportunity to present their accomplishments from the past year and to reaffirm their ambition of producing a significant impact on societies across Central and Eastern Europe. At the same time, through the Aspen Leadership Awardswe acknowledge specific efforts and personal commitment to values-based, creative and transformative leadership of people that have had a significant contribution to the over-all advancement of society. The Aspen Gala is a fundraising event for which we invite each year our community, partners and friends to join us as sponsors, in support of our Leadership Initiatives. With the help of the generous contributions of our sponsors, we are able to offer each year scholarships for public sector and NGO representatives to attend the Aspen Seminar for Leaders, to organize the Aspen Junior Seminar (program attended by students and young professionals aged 20 to 24) and also the newly launched Aspen Public Service Leadership Program, a fellowship based program dedicated to the promising representatives from various authorities, who can become promoters of change and improvement in the public sector. Moreover, the continued commitment of our partners to our activities enables us to provide recognition to a social project developed by a fellow or an alumnus/ alumna, to be chosen by the vote of the Aspen Community and presented at the Gala. The Gala is a Black tie, table seating event, open only to members of the Aspen community. The Values Based Leadership Award is presented to a public leader or national organization that has excelled in his/her field of activity, by constantly supporting and promoting national and universal values. Adrian Curaj is the one of the artisans and a strong promoter for the “Laser Valley – Land of Lights” project, which involves the development of a smart city and a dynamic, innovative and entrepreneurial community around the ELI Nuclear Physics (ELI-NP) in Măgurele city (Romania). The Service with Dignity Leadership Award is presented to a Romanian public servant that has proven constant effort to exemplary fulfill work duties and go beyond those, as a role model for the community. By their impeccable professional and ethical standards, those nominated for this award are seen as guardians of the Good Society, leaders among their peers and as a source of pride and inspiration. A fair and just appreciation of the „Carpathian Falcons” values and traditions impels us to a journey through history. The 812 Battalion ,,BISTRIŢA” Infantry has been founded on March 1st, 1995 at the order of the Ministry of Defense from January 26th, 1995 in Dej. Starting with August 1st, 1995, the Infantry has been deployed in Bistriţa, as part of the Chief of the Romanian General Staff from May 16th, 1995. In 2004, the Battalion has been awarded the honorary recognition for its mission, „Carpathian Falcons”. On June 11th, 2008, as part of the approval of the Ministry of Defense based on the report of the Chief of the Romanian General Staff dated from June 5th, 2008, they have been awarded the honorary distinction of ,,BISTRIŢA”. In 2009, the battalion receives the approval of the use of the heraldic sign. Being one of the few units to have been nominated to undergo international missions, the 812 Battalion Infantry has been executing beginning with 1996 an array of pioneering missions within the Romanian Army. Ever since its inception, this unit has benefited from the experience of having participated in a series of missions outside of the national territory, having been deployed in 3 continents (Africa, Europe and Asia), ranging from Angola (1996-1998 Unavem III mission) to Kosovo (2002, Belurokos mission), Iraq (2005, Antica mission) and Afghanistan (2003, Enduring Freedom mission). The Emblem of Honor of the Romanian Army with war signage. Unfortunately, throughout the course of these missions, 3 of the armed camarades: (cpt. Ţifrea Cătălin, slt. (p.m.) Filip Cristian and slt. (p.m) Sfecheş Marius) have lost their lives, paying the ultimate tribute to the glory and honor of the Romanian Army. Between July 2018 and January 2019 the 812 Infantry Battalion is taking part in NATO’s mission Resolute Support, in Afghanistan. The mission’s primary objectives are providing the security of the military base and training the Afghan military forces. This proves Romania’s strong commitment with NATO and the Romanian Army’s solid contribution to many of the Alliance’s activities and missions. The 2018 Service with Dignity Leadership Award is presented by Ms. Cătălina Iuga and Mr. Vasile Iuga. The Sports and Society Leadership Award is presented to an individual or a group who has transformed sports into more than a physical activity. The nominees for this award stand as a model of commitment, dedication and professionalism. A former Junior No. 1 in Europe, Mihaela Buzărnescu has enjoyed most of her success on the ITF (International Tennis Federation) Circuit where she holds 22 singles and 34 double titles, including seven singles titles 2017. A 30-year-old, broke into the WTA Top 100 for the first time in her career on October 16, 2017 to become the oldest Top 100 debutante since 33-year-old Obziler in February of 2007. Mihaela Buzărnescu rose 484 ranking spots from the start of 2017 to 2018 and achieved a career-high ranking of World No. 20 on August 26, 2018, following a third round run at Wimbledon, having also reached the last 16 at Roland Garros. Buzărnescu has a career high WTA singles ranking of No. 20, achieved on 6 August 2018. She has a career high WTA doubles ranking of No. 28, achieved on 1 October 2018. Mihaela Buzărnescu leads the WTA hierarchy of tennis players with most matches played in 2018: 55 to singles and 47 to doubles. She has a PhD in sports science from UNEFS in Bucharest. The 2018 Sports and Society Leadership Award is presented by Raiffeisen Bank. The Innovation and Technology Leadership Award is presented to a leader or an organization which brought significant contribution in the field of innovation and research, or the entrepreneurial environment. Innovation stands a cornerstone to social and economic progress. Started by two remarkable Romanian entrepreneurs, Daniel Dines and Marius Tîrcă, UiPath is now a truly global company with offices world-wide, from New York, to Paris, to Tokyo. Recently named the 6th happiest place to work by Comparably in the US, UiPath has become one of the fastest growing enterprise software companies in history. The company is backed by over $400 million in funding from Accel, CapitalG, Credo Ventures, Earlybird’s Digital East Fund, IVP, Kleiner Perkins, Madrona Venture Group, Meritech Capital, Seedcamp and Sequoia. The 2018 Innovation and Technology Leadership Award is presented by ExxonMobil Romania. The Arts and Society Leadership Award is presented to an individual or organization who has significantly contributed to the enrichment of Romanian culture, promoted Romania abroad and supported the overall development of the country’s cultural patrimony. Andrei Borțun is The Institute Foundation’s CEO. Andrei is also a partner in “Dăescu Borțun Olteanu” PR agency and “Rusu + Borțun Brand Growers” advertising agency. During this time, The Institute also organized design exhibitions in several European cities such as Portoroz, Stockholm, Vienna, Londra, Madrid, Cluj, Braşov, Timişoara, Chișinău. The Institute’s mission is to modernize Romania using the power of creative industries. The 2018 Arts and Society Leadership Award Leadership Award is presented by UniCredit Bank. This year marks the 20th anniversary of the US-Romania strategic partnership. Aspen Energy Lab (AEL) was launched on February 5, 2016, in Bucharest, and benefited from the presence of reputed national officials and experts working in the energy sector.